This is the 20th in series of Giveaways in Avinashtech Birthday Celebrations i.e. ABC-20. We are giving away 10 licenses of SUPERAntiSpyware Professional Edition with Lifetime Updates to Avtechies. PS:- This review is done by our Forum Mod Ashwin who blogs at Ashwingeek. “SUPERAntiSpyware is the most thorough scanner on the market. Our Multi-Dimensional Scanning and Process Interrogation Technology will detect spyware that other products miss! SUPERAntiSpyware will remove ALL the Spyware, NOT just the easy ones! SUPERAntiSpyware (SAS) is one of the most popular spyware removal softwares that has been around for a while. It is available in free and pro versions. The pro version includes a lifetime subscription (free upgrades to future versions), realtime protection, automatic/scheduled updates and scheduled scans. Quick scan: which scans registry items, and other common places where spywares, adwares may be installed. Complete scan: thorough scan of your entire computer. Quarantined items will be placed here and you can restore a quarantined item if you are sure that it is a false positive or remove them from quarantine. A whole bunch of settings are available under this tab. The most useful of which is under “Hi-Jack Protection“, which can prevent changes to your browser’s homepage. First chance prevention scans your PC to detect and remove any infections at start-up/shutdown. Since I don’t surf on wazez/or other bad sites, I haven’t really encountered anything harmful, but its always good to be on the safe side and scan your PC regularly. SAS is very light on resources, idle memory usage is usually around 600 to 700K. Since it is not a full-powered anti-virus, I would recommend that you use SUPERAntiSpyware alongside a good Anti-virus like Avast,or Avira or any AV of your choice. I use SAS Pro alongside MBAM(free), Avast Home AV, Online Armor FW and WinPatrol Plus without any slowdowns/conflicts. Leave a comment below telling why you would like to have SUPERAntiSpyware License. PS:- Keep in mind, Multiple entries will disqualify you from the draw. I hate disqualifying People who think they can use different names or email addresses. There is more than just your name or email which can tell its duplicate entry. Also, use same Name in Step 2 and 3. So far I have occasionally used as an additional SAS portable scanner. Enough time has detected various types of malware and to those who did not reval Malwarebyte’s Anti-Malware and Hitman Pro. I would like to try SAS Pro as a real-time protection. 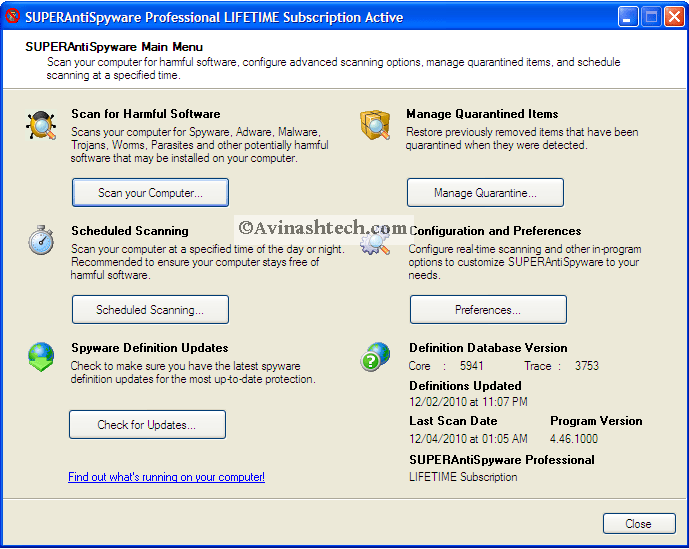 SUPERAntiSpyware Pro with lifetime updates. Count me in. It’s a terrific program and not having to worry about renewing your malware software every year would be great. SAS is the best software out for Malware, Spyware, and cookies. SUPERAntiSpyware is good protection against attacks from the Internet. I would be happy with one license for it to protect my computer from trojans, malware, etc. Thank you Avi for giveaway. Well, after so many long years of using its freeware build, it’s about time to consider owning and deploying the licensed, professional version of trustworthy SUPERAntiSpyware. Thanks a lot, more power to your helpful, highly informative blog, Av. thanks for this great christmas offer and review. In my current Security setup is such a software missing to defeat maleware and other spyware. So it would be nice to bridge this gap with SUPERAntiSpyware because it’s very popular and offers lifetime updates. I want a good program SUPERAntiSpyware license. Strange question!!! Everybody wants, and more than that, needs this exellent program, because it is superb!!! As for me, I need it because I want to surf the Internet safely, and keep my computer clean. That’s all! I would like to have a license of this product for myself. I learned quite a bit by reading your review Ashwin as you done an outstanding job at it. I would really like a licence of SAS please. Thanks SUPERAntiSpyware is nice with Real-time protection and automatic updates. Hi Avinash and Ashwin, congratulations for the review and for the giveaway. I’ve always wanted to have a SAS Pro license, but I’ve never had any luck so far. I use SAS free, and I’ve used it for a long time. It would be a great upgrade to win a Pro license, due to the realtime protection. Please count me in. Thanks in advance. Merry Christmas. PS: I’m a subscriber and a Forum member. I would like this license. I have heard of this software many times. SAS is truly more than a Malware, Spyware, cookie software. It is a all-in-one ultimate security protection software. The company prides themselves on being on top of threats and protecting their customers. I would love to win a licence. First thanks for the much recommended SUPERAntiSpyware Pro giveaway,really need this one for realtime protection and automatic updates.Many thanks to Mod Ashwin too for the clear review. SuperAntiSpyware protects your pc from any attacks of malware,spywares,threats etc. ensuring maximum security and safety. Thnx Ashwin for the detailed review. Have been using SAS free version for a while to enhance and ensure my systems safety. The real-time protection SAS Pro provides in preventing spyware and malware attacks and its compatibility with almost all other security suites without hogging system resources makes it an excellent choice to complement the protection provided by the regular Anti-virus suites. Pls count me in, would love to experience its Pro benefits. I really like SuperAntiSpyware. I think it is a great program. I have always used the free version but would like to have the pro version for real-time protection. Thank you Avinashtech for giving us a chance to win it! I use the free version and would like the lifetime licence so i may have real time protection. SAS is one of my favorite softwares and I hope to win one. Thanks for the giveaway. SUPERAntiSpyware can be worked together with all current AV w/o any conflicts. It act as supplimentary protection for you computer. Hope to win 1 license so may upgrade my free version. I could use a really powerful & reliable antispyware program to protect my pc. Currently using free version so I hope to upgrade to the pro version. Thank you. using free version of SAS, a pro llicense add a addition realtime , if some virus skip by my panda cloud , then SAS pro will detect them . I need anti-malware and spyware please consider me and thanks for the giveaway. Count me in thanks,be great to have full version of SAS ,i use free at moment it’s excellent. Amazing giveaway , I hope i will win a license. I need the license because SAS is one of the best AntiSpyware program in the market, so I need it to protect my PC from spyware and other bad stuff. Great Giveaway.Count on me because it’s great piece of software.I’m using free version for years and it’s great.If Pro version(realtime scanning) is half a good like free version you don’t have to use massive IS-es who make your comp too slow(especially if you have older machine). I want to use this Anti Malware software to protect my windows from “the Outsiders”. So I hope I can win this one..
congrattulations on ashwin’s review and on your new fantastic giveaway. Since I do not believe a resident antivirus is sufficient to protect a computer I’d like to add an extra layer protection and SAS pro might do the job fine. Hi, great giveaway please count me in. Iâ€™ve been using the free edition of SUPERAntiSpyware for over an year now and I found it extremely easy to use and it detection rate is fast and accurate compared to some commercial software. I would love to win a lifetime license so that I can experience the full version of this security software. Thanks for this, to Stop All The Malwares then will be easy with Superantispyware and more accurately the pro version and its realtime protection. I got this for my daughter’s desktop about a year ago for $14.95 to run alongside Avira Personal.Before installing it,my monthly battery of scans on her comp always turned up a Trojan or two,and the occasional worm.Now I only find adware tracking cookies,so it must be doing it’s job.She complains that it takes longer for her browser to open (which it does),but that’s a very small price to pay for effective protection.Thanks again Avi !! I’d love to take part…. A great giveaway (Lifetime License)! Currently using the free version. Works really well. Count me in for a license. Thank you. Right now I am using the free version, and this is an excellent opportunity to have the Pro. versionâ€¦ Thanks a lot! I would like to win a license because of SUPERAntiSpyware Professional is a high quality antispyware to prevent malware attacks on your PC. Nice to have this as a full fledged program for protecting your pc from malware and spyware. WOuld like to throw in my name for this giveaway. Thank you for it.Regards. Hello. This is not good because i did not win malwarebytes giveaway and i did not win emsisoft antimalware giveaway. Really i am very sad. Please let me win SUPERAntiSpyware Professional Edition. Please enter me in the SUPERAntiSpyware Pro giveaway. I have been using the free version and it would be nice to have the real-time protection and automatic updates of the pro version. SAS pro is the best antispyware software and it also comes with Lifetime Updates which is the best for me. Use The freeware would love the Pro version.Thanks for the chance. Super giveaway. I’m currently using SUPERAntiSpyware Free Edition, which does not include real-time blocking or scheduled scanning. The SUPERAntiSpyware Pro Edition will be really great! I’m using SUPERAntiSpyware Free Edition. It would be great if I could unlock the advanced functions. scopic – Belgium – 21 dec 2010. Thanks for the giveaway. One cant rely on just a AV for all-round protection. SAS Pro is a great supplement to it. I’d really want to have a license. great program! scan is a bit slow, but thorough…catches things others miss. would love to have the pro version! Thanks for the giveaway sir.I want Super antispyware because i have lost Malwarebytes giveaway and Super antispyware is the best replacement for it.Both malwarebytes and superantispyware has equivalent detection rate and features ,however Super antispyware is able to find some rootkits that Malwarebytes missed out.I really really want i license key.Hope i win this time. I had a blackout a week ago an the computer slowed down and performance slowed down and themes got changed. I really would appreciate if you would help me by giving me a key. Please send me SUPERAntispyware key to e-mail : [email protected] Thank you !